The z-transform converts a discrete-time signal, which is a sequence of real or complex numbers, into a complex-frequency domain representation. By considering it as a discrete-time equivalent of the Laplace transform, it permits concepts that are useful in the discussion of continuous-time signals and circuits to be carried over into the discussion of discrete-time signals and circuits. 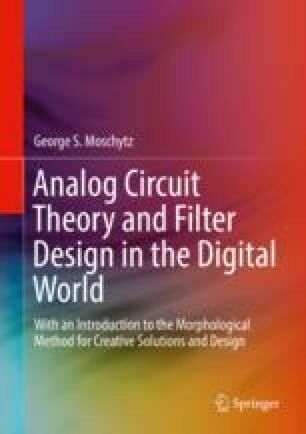 This enables continuous-time concepts and insights that were introduced in the first part of this book to be readily transferred into this second part which deals with sampled-data and discrete-time signals and circuits. In this way the discussion of principles related to the frequency- or s-plane in the analog world can easily be understood when discussed in the corresponding frequency- or z-plane in the digital world. The former relates to a Cartesian and the latter to a polar coordinate system; in each of them, the location of the poles and zeros of the corresponding filter function plays a critical role. The similarities of the two systems are valid only up to a point, but they are important and useful enough to be discussed on their own in this short chapter.